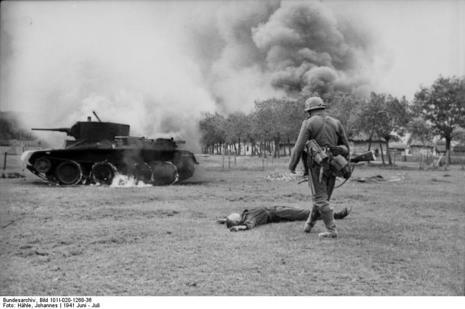 The Battle of Białystok–Minsk was a German strategic operation conducted by the Army Group Centre during penetration of the Soviet border region during the opening stage of Operation Barbarossa lasting from 22 to 29 June 1941. 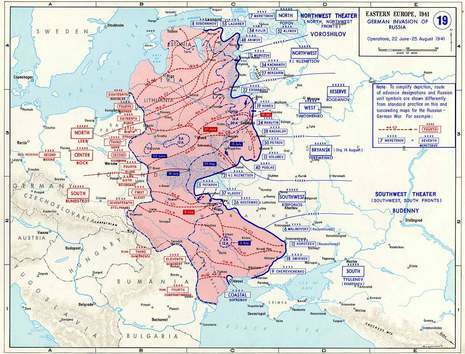 Its goal was encirclement of the Red Army forces around Minsk. Commanded by Field Marshal Fedor von Bock, Army Group Centre was tasked with attacking from Poland through the Białystok - Minsk - Smolensk axis towards Moscow. The Army Group included the 9th and 4th Armies. Its armored forces were Hoth's 3rd Panzergruppe and Guderian's 2nd Panzergruppe. The two infantry Armies fielded 33 Divisions and the Panzer Armies fielded 9 armored Divisions, 6 motorized divisions and a cavalry division. Army Group Center could call upon 2nd Air Fleet for air support. Facing the German Army Group Center was the Red Army's Western Front commanded by General Dmitry Pavlov. It included the 3rd, 4th, and 10th Armies along the frontier. The 13th Army was held as part of the Stavka High Command Reserve and initially existed as a headquarters unit only, with no assigned forces. All together, the Soviet Western Front had 25 Rifle and Cavalry divisions, 13 tank and 7 motorized divisions. 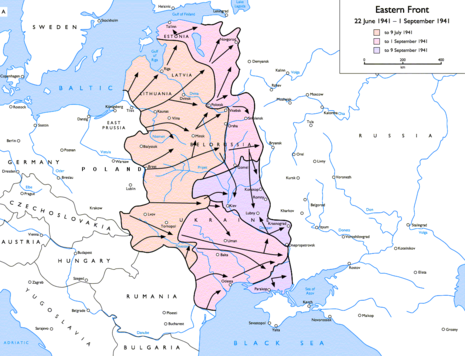 The Red Army disposition in Belarus was based on the idea of an aggressive response to a German attack, carrying the war into German-occupied Poland, but suffered from weakness along the flanks, created by the line of demarcation placement following the division of Poland in 1939. This forward placement of strong Soviet forces in a double-bulge defensive position enabled the OKH to undertake a double envelopment, severing most of Western Front's forces from other Soviet forces in a twin encirclement, centred on Białystok and Navahrudak, to the west of Minsk. When operation Barbarossa opened on the 22nd of June 1941, one of the most prominent axes, was the one from Bialystok to Minsk. The pattern of the border in this area formed a prominent bulge to the west of Bialystok, which offered German forces a tempting opportunity to attack the Russian flanks and encircle large concentrations of Russian forces. This portion of the border was defended by forces of the Western Military District, which became the Western Front following the opening of hostilities.